Her holistic approach to creating the perfect smile. 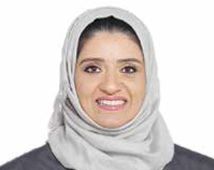 Dr. Aysha Al Mansoori is a recognised expert in the field of Aesthetic Dentistry, and a trusted practitioner to patients in Bahrain and the GCC. She is renowned not only for her expertise, but also for her ability to make patients feel completely at ease. She is passionate about her work, and is an artist when it comes to aesthetic dentistry, transforming the smiles, and lives, of countless patients. Dr. Aysha has over 20 years experience in General Dentistry and holds numerous degrees and specialist certifications. These include a Clinical Masters Degree in Aesthetic Dentistry from the University of California, and a Diploma in Neuromuscular Orthodontics from Italy. She is also a certified Dental Implantologist and Dental Face Lift Practitioner, and has obtain a certificate of membership in the American Academy of Anti-Ageing. Her holistic approach to creating the perfect smile for her patients sees her taking into consideration a wide range of elements, such as facial height, the size and shape of the lips and jaw alignment. She then incorporates orthodontics as well as veneers in order to provide an end result that is sure to make you smile.